Host a Pop Up Makerspace Program in your library! The New Mexico State Library Makerstate Initiative is hitting the road again and looking for libraries interested in hosting Pop Up Makerspace programs this spring and summer. Are you interested in hosting a makerspace program in your library? Changes to Makerstate Initiative: Although we will still be offering programs in the spring and summer this year, our focus is shifting toward professional development for librarians. Due to this shift we have made some changes to our current program options. This year we will only be offering one-day workshops to each selected library. Also, due to changes in staff there will be a limit of 20 maximum participants per workshop. Willingness of library staff to promote and participate in the program. Geographic proximity to other selected locations to facilitate as many programs as possible. Although we are more likely to select applicants we have not visited before, we DO still consider applicants who have already hosted a Makerstate program. Want more Pop Up Makerspace programs in your library? Keep an eye out for professional development opportunities offered through the Makerstate Initiative! Not only will there be several opportunities throughout the state to be trained on our programs, but we are also developing kits for check out with all the necessary materials to run maker programs in your library. Description: During this workshop participants will be individually scanned for 3D printing. While participants wait for the printers to create their 3D constructed models, they will have the opportunity to learn how to design for 3D printing through an online CAD program. Each participant will get to leave with a 3D printed model of themselves. NOTE: 3D printing is a time consuming process and the equipment is sensitive to travel and may require troubleshooting. If we are unable to complete all prints during the workshop time we will send prints as soon as we are able to complete them. Parents and community members are allowed to participate in this workshop and learn about 3D printing. However we will only 3D print the registered children or teens. We will not 3D print adults during this workshop. Description: During this workshop participants will learn the basics of electricity and simple circuitry. 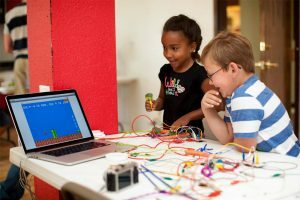 Then they will get to experiment with different types of simple circuits including MakeyMakey, littleBits, Squishy Circuits, and Toothbrush Robots. Description: During this workshop participants will learn the basics of electricity, simple circuits, and paper engineering. Participants will be able to make their own interactive light up origami or interactive light up pop up cards. NOTE: This workshop is recommended for teens or families (children with adult supervision) because of the tools we will be using. Description: During this workshop participants will learn the basics of video game design and Scratch programming. Participants will be able to create their own version of an intro level video game. Description: During this workshop participants will learn the basics of electricity, simple circuitry, and sewing. Each participant will design and sew their own light up bookmark using conductive thread and sewable electronics. Description: During this workshop participants will get to learn about 3D printing, simple circuitry, and paper engineering. Participants will get to see a 3D printer in action, experiment with circuits, and make an interactive pop up card to take home. Note: This workshop is setup in stations and will require at least two library staff members to assist. Library staff will be required to review the stations before the workshop in order to assist.